Wouldn't this make a great Housewarming card? 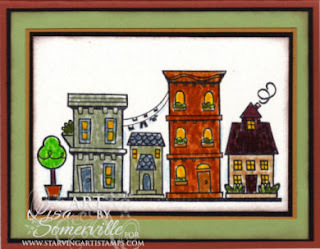 I used the VanGough Technique from the June TJNL to color the DoodleFactory Neighborhood from Starving Artistamps. If your a subscriber to the newsletter be sure to check out Pat's Blog post on how you can enter the Van Gough Contest sponsored by Starving Artistamps and the TJNL.